The Washington Capitals force a game 7 vs the Tampa Bay Lightning in the Eastern Conference finals. This will be an uphill battle for Washington as they’ve only gone 4-11 all-time in game 7’s. Game 7 Wednesday 8:00 pm. ET. According to reports, the NFL will announce Glendale, Arizona and New Orleans as the next hosts of Superbowls 2023 and 2024. 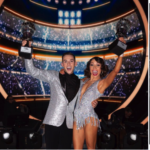 Olympic figure skater Adam Rippon won the all-athlete version of Dancing with the Stars. Washington Redskins defensive back Josh Norman came in second with controversial and recently redeemed skater Tonya Harding rounding out third.